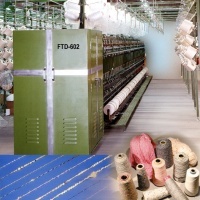 Feature: The fancy yarn twisting system is equipped with two independent floating thread rollers and core thread roller for the production of various types of modern fancy yarns, such as soft and parallel fancy yarns. Two independent rollers are capable of mixing every single color into colored fancy yarns. The floating threads and core thread lead into the false twisting shaft, thus wound together to produce fantasy yarns. Design and manufacture every kind of machine.